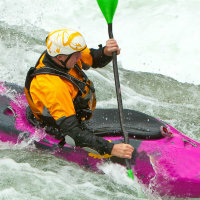 The sit on top kayak is a kayak that is shaped such that it does not hold water. This means that it does not have a cockpit that you sit in but rather has a shaped deck that (as the name suggests) you sit on top of. The range of shapes and sizes in which they come is very varied and the ranges available are growing all the time. 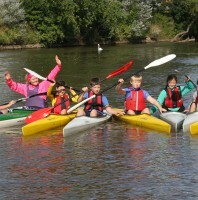 They are inherently fairly safe boats, most are very stable and easy to learn to paddle and therefore popular with the rental market, the guided tour for the complete beginner and generally pottering about and family fun in and on the water. Having said this they come into their own as specialist boats in some areas the most common ones being the fishing kayaks and surf skis and sea touring boats. 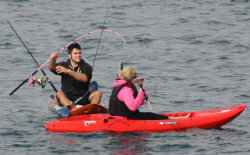 As fishing kayaks, surfskis and sea kayaks have their own pages we will concentrate here on other sit on top and in particular the easy to paddle recreational and introductory levels. Good for chilling in the sun! 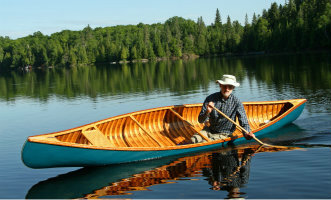 As we have already alluded to these kayaks come in many forms and are used in many ways. Fishing from the sit on top is a popular pastime but there are plenty of other ways to use the stable floating platform to enjoy the great out-doors. Bird watchers and photographers will love the stable platform that can get them to locations they would never reach on foot and without a motor to disturb the wildlife will get to see and photograph so much more. The longer better tracking boats are great for touring and can be used on rivers, lakes and the sea. Ignoring the specialist sea boats (which are covered under sea kayaks), in general, if you want to cover some distance you need to look for a boat with good tracking (so a bit of keel and not too much rocker) and a longer boat. We have used the Disco made by RTM Kayaks for some cruising in Menorca and found it a nice cruising boat so long as you don't want to try to push it up above its top speed. You might want to use a sit on top as a boat for fitness paddling if you live near the sea or a lake that can get a bit choppy. Surf Skis are often used for fitness paddling on the sea but can be a bit extreme in stability and cost. If this is the case then choose one of the longer touring sit on tops for a good work out at reasonable cost. If you need to drive somewhere for your workout you might chose a shorter boat, you won't go as fast but you'll still get a work out. There are some nicely shaped surf boats amongst the sit on top range. Shorter in length with more rocker at the front and some with a seat position and boat volume nearer the tail these boats will pick up a wave and take you in at speed. You'll need leg straps / knee braces and will need to develop more skills to paddle these boats well but the reward of skimming down the waves will be worth it. The snorkeler will find that a sit on top is a perfect boat to paddle out to find the areas of reef that no one else has made it to. Don't forget a leash for your paddles and an anchor to hold your kayak whilst you snorkel, but don't damage any coral in the process. Contrary to popular belief some sit on tops can and are used to paddle white water and run rapids. The shorter more manoeuvrable kayaks without or with minimal keel will be the best options and knee braces will be needed. Knee braces / leg straps provide the support that enables the paddler to control the kayak through the hips and body leaning it with the water. Manoeuvrability will never be quite what it is with a closed cockpit kayak but the right boat in the hands of the right paddler can provide plenty of fun. These boats are better suited to wide bouncy rapids and surfing waves than a fast, twisting river requiring lots of quick turns. Ocean Kayaks make a sit on top called a "Nalu" that has been designed to double as a SUP (stand up paddle board) as well as a kayak. Chose suitable paddles for your anticipated paddling and budget. 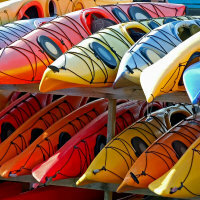 As with all kayaks the shape, weight and volume will determine the handling characteristics. Most of the models designed for recreation, family paddling and fishing are made from polyethelene (plastic) and so are inherently on the heavier side. This weight inevitably makes them less responsive and manoeuvrable than many other types of kayak but they are also incredibly robust, low maintenance and reasonably priced. Surf skis and faster touring/ sea boat sit on top designs come in a wider range of constructions including fibreglass, kevlar and composite constructions and are therefore lighter weight, more responsive and manoeuvrable for their shape and size. In terms of shape the same design principals hold as for any other kayak. Short and wide equals stable and manoeuvrable whilst long and thin equals faster with better tracking but harder to turn. 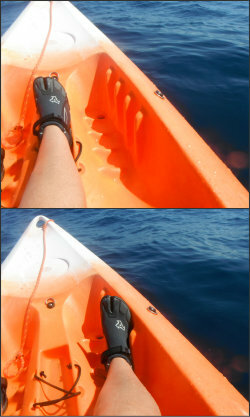 There are lots of double sit on top kayaks and many will accommodate three (or more) lighter paddlers. When looking at the sit on top kayak for recreation there are various fittings that will be of more or less importance depending on how you plan to use your boat. Some models have hatches which can be used to store drinks, food, spare clothing etc. if you plan on using the boat for you and the family to paddle at a beach without making any journeys then a hatch is not important. However if you want to be able to go off for a few hours at a time and find a nice lunch spot then a hatch can be very useful. Different models have different footrest and seating arrangements. The better your sitting position the more comfortable you will be and the less tired you will get as you will be able to do a better paddling stroke. Again for messing around on a beach with the children and not doing any distance this is not as important as it is if you want to put some distance in. For best performance you need to be able to put your feet on the footrest with your legs bent. You then need to be able to press with your legs through your feet without your legs completely straightening. You will get a better push if you have a backrest to push against and if your footrest has small enough adjustments to get it in the right place for your height. Some footrests are moulded into the deck whilst others have adjustable pedals. The adjustable pedals will give you a better fit but will probably need adjusting when different family members use the boat. Some sit on top kayaks come with optional or "deluxe" seating. Try the seats out and see what support you get. A high back seat may be great for a fishing kayak but not necessary or helpful for touring where a low backrest to push against will be the best option. 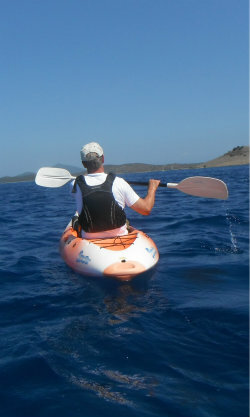 Amongst other things sit on top kayaks differ from closed cockpit kayaks in that there is a less control of the boat using bodyweight and hip action since the paddler is not connected to the boat sufficiently. The use of leg straps provides some of that control. The straps run from the seat area to a position near the footrest and the knees tuck under the straps such that when the knees are squeezed together the straps come under tension. The paddler then gains an element of control over the way the boat leans and is able to hold themself more securely onto the kayak. Look for footrests that you can use. Using your legs will make you paddle better. As with most accessories try out the various options at your local outfitters to find something that suits you. If you plan on using you boat in a way that might mean you leaving go of your paddles periodically you might want to invest in a paddle leash. This attaches your paddles to your kayak and ensures that you don't leave go of them only to find they have drifted off and you can't find them. You will find a leash like this a nuisance if you are mainly going to be paddling your sit on top, but if you are going to be anchoring up bird watching, taking photographs, fishing etc. a leash can be invaluable. Talking of anchoring up. Light weight anchors can be purchased to lower whist you are busy watching those birds or taking those photos or catching those fish. Without an anchor you will need to keep a close eye on where you might be drifting to or constantly putting in corrective strokes to keep you kayak where you want it to be. We have found an amazing sit on top kayak database that you can use to look up the range of boats you might be interested in. 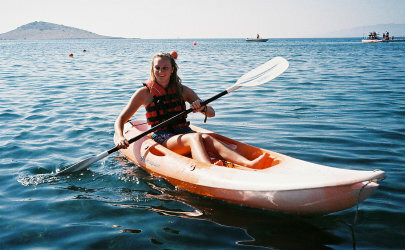 This site also carries a wealth of information on sit on top kayaks.